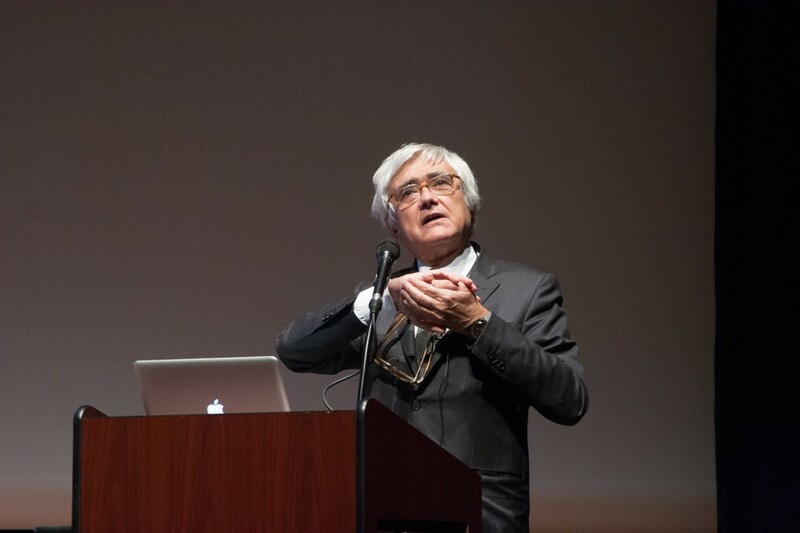 World-renowned architect Rafael Viñoly, the man behind the new Center for Care and Discovery, spoke about his vision for the 10-story, 1.2 million–square foot addition to the hospital at the Logan Center last night. The Center, planned to open in February, is the first of six new buildings to be constructed collectively in five phases, ultimately resulting in a complex of over three million square feet of new medical space for the U of C Medical Center. The Center is the architect’s second project for the University—Viñoly designed the Charles M. Harper Center for the Booth School of Business in 2004. For this project, Viñoly used “modules,” structurally sound architectural units of nearly 3 feet by 1.5 feet, which allow for flexibility should the technological and functional needs of the hospital change. In addition, the close proximity to the Gordon Center for Integrative Science and Knapp Center for Biomedical Discovery is meant to allow for more efficient translation from research to treatment for patients with complicated conditions. Although the individual hospital rooms are intentionally small to prevent families from lingering, the Center is not supposed to be impersonal. He added that the design of the building wasn’t the only factor that would determine the character of the building. “The most significant part of a building is the software, not the hardware,” Viñoly said. The Sky Balcony, which looks out onto downtown and Lake Michigan, and the ground floor of the hospital will be open to the public, in order to foster connections with the community. There will even be a place for students to go while “studying philosophy or something,” Viñoly said. Steve Karlowski, a Frank Lloyd Wright preservationist and Robie House tour guide, also said that visitors often appreciate the cohesiveness of Viñoly’s Charles M. Harper Center construction with the Robie House next door. However, Lonn agreed with Viñoly that the design enhances the adaptability and longevity of the building, which he acknowledged were more important for a hospital. During a panel at the end of Viñoly’s talk, Everett Vokes, chairman of the Department of Medicine and physician-in-chief at the Medical Center, added that the aesthetics of the building would help patients with recovery. “It’s beautiful, and it’s human, and it will participate in the healing process,” he said.